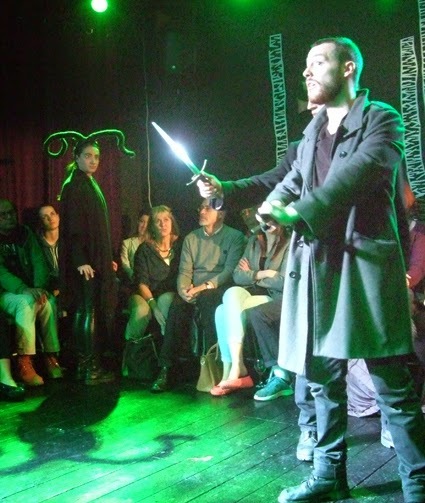 The Weird Sisters from Shakespeare's Macbeth are probably the most famous witches on stage or screen, so how could I resist going to a production of "The Scottish Play" at a theatre in a pub not far from where I live in South London - The Bridge House Tavern, in Penge, SE20. I find Shakespeare's portrayal of the witches fascinating. The play was written at a time when witches were feared and persecuted, and the Weird Sisters are described as "secret, black, and midnight hags" chanting "Double, double toil and trouble" as they cast entrails into a bubbling cauldron of poison. Modern-day fluffy little Wiccans they aren't, but they are also not necessarily the true evil-doers of the piece. It is left ambigious whether the witches merely prophesy the bloody game of thrones that is to come or whether they deliberately set Macbeth on his path of regicide. Various versions of the play that I have seen have portrayed the witches in different ways - in some they seem merely mortal troublemakers, in others they are Otherworldly creatures tempting and teasing a weak-willed mortal man who would be king. The production at The Bridge House is in some ways a traditional portrayal of cackling hags, yet powerfully acted with minimal set or props. The staging itself is anything but traditional. The theatre is in an upstairs repurposed room at the pub, with seating all around walls that are entirely painted black, as are the floor and ceiling. 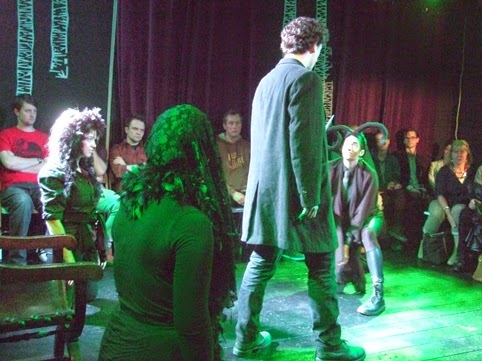 The audience is very close to the action, which takes place under bright spotlights and it makes for an intense experience. One not to be missed if you live in south east London.